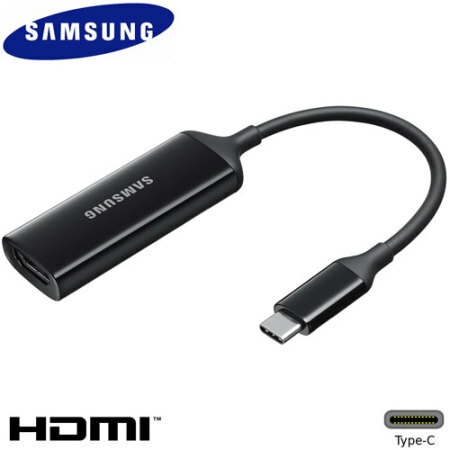 Connect your USB-C smartphone to your HDMI television or monitor with the official Samsung HDMI Adapter. With a compatible smartphone, you can enjoy videos, photos and even games on the big screen. Trying to connect tablet via usbc to hdmi via adapter no go ? So easy to use. Just plug and play. Didn't have this in stock at local Samsung store. Mobie Fun was one of few places that carry it. Works great with our older TV with HDMI port. If you can't cast wirelessly to your TV or monitor, this is the way to go! Bought this to connect my S9 plus to my tv with out having to worry about a Wi-Fi connection for mirroring. Brilliant piece of kit, much smoother than mirroring. The the item is as the description said. I am very satisfied. I will be ordering more. Just plug it into the phone's USB-C port, connect via an HDMI cable (not included) to an HDMI port on a TV and bingo! Instant mirroring of phone on TV. With Galaxy S8 picture quality is superb and any TV can be used as a smart TV with Netflix or whatever is on the phone. It would be good if Samsung made a cable with USB-C male one end and HDMI male the other end so there would be no need for a separate HDMI cable. One less cable to carry when travelling. I have used the adaptor and it works as it should. You have NETFLIX on you TV! So easy to use. I wasn't sure how it would but once you attach your own hdmi cord to the adaptor bam! You have NETFLIX on you TV! Or whatever else from your phone...amazing. company was great . Delivered and great instructions! Works brilliantly with my t.v and great picture quality bit expensive but well worth the money. This product is only available at mobilefun as I've looked elsewhere with no luck. So well done to mobilefun for having this product. This product is very easy to use and works very well.All you need is a HDMI cable.I would recommend it.Great product.